Kim Sun Ah who is starring in MBC Wednesday and Thursday drama series “I Do I Do” appeared at the birthday party of Lee Jang Woo, bringing surprise. On the afternoon of June 3rd, 2012, Kin Sun Ah wrote on her Facebook account, “Not long ago, the birthday of our director of photography and Tae Kang! As had to shoot all night, can only simply ate birthday cake on the set to celebrate! Jang Woo has been very series and hardworking, making us much stronger, wish him a Happy Birthday!” And she also uploaded a photo. 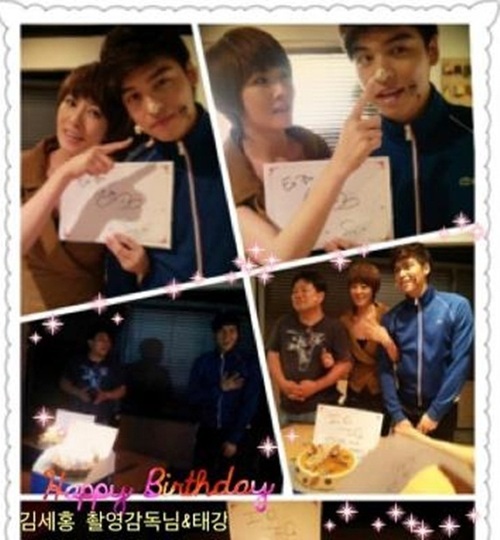 In the photo, Kim Sun Ah was laying cake on the face of Lee Jang Woo as a joke, bringing surprise to the birthday party, and showing the harmonious atmosphere. She held the arms of directory of photography and Lee Jang Woo, holding the birthday party in a warm atmosphere. Netizens said, “Although a bit late, Happy Birthday Lee Jang Woo,” “Kim Sun Ah is good in coquetry,” “The team power of ‘I Do I Do’ is really impressive” and so on. On the other hand, June 1st is the birthday of Lee Jang Woo.